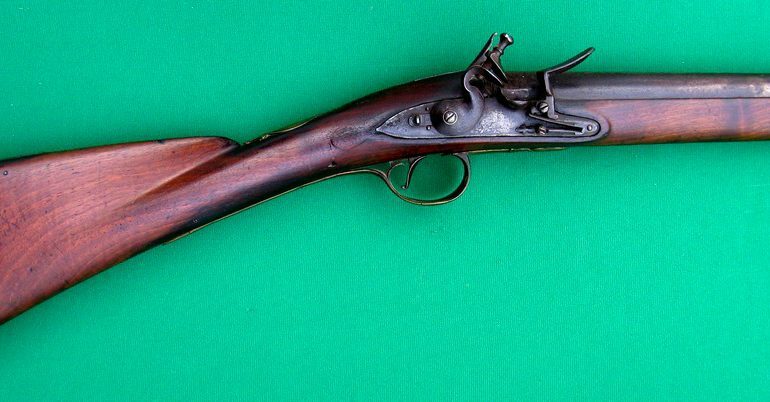 A FINE+ & RARE FRENCH & INDIAN/REVOLUTIONARY WAR PERIOD ENGLISH FLINTLOCK MUSKET-BORE OFFICER’S FUSIL, by HOLDEN, ca. 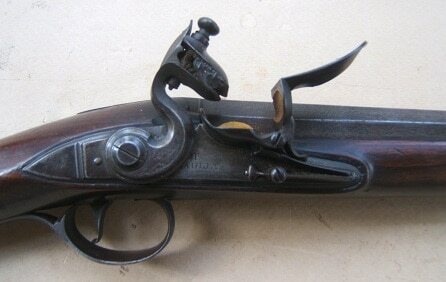 1760: In overall fine+ original flintlock condition. Fine quality lightly engraved, octagonal-to-round, smoothbore, key-fastened, 39 1/2″, .78 caliber (Musket-Bore), browned (85%), steel barrel with a scroll engraved barrel-tang/rear sight. Slightly flared muzzle, silver foresight, two (2) early London Gunmaker, Co. proof-marks and a hooked-type breech. Fine touch-hole and smooth steel surfaces with some scattered light patches of discoloration/fine pitting; and the breech-top with a “HOLDEN BILLINGHURST” maker’s signature/address, within a balloon-type border. Untouched, smooth, brown surfaces with some light discoloration and expected fine pitting, at the touch-hole/breech. Molded and carved, nicely figured, Walnut fullstock of classic Georgian design with a sculpted and deeply fluted comb and a finely executed raised carved scallop-shell apron, at the barrel tang: raised teardrops, around the lock and sideplate mortises. Embossed and engraved brass mounts with fine surfaces and some scattered light patches of discoloration. 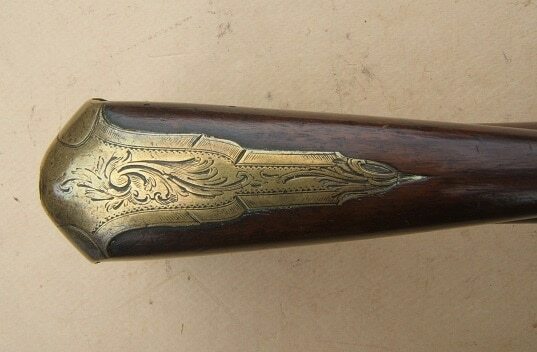 The trigger-guard with an embossed acanthus leaf forward finial and a finely engraved “Tudor Rose”, on its bow. The buttplate, en suite with an engraved, stepped, pin-fastened tang. Three (3) barrel-form ramrod pipes: entry-pipe with engraved finial and the wrist with a silver wire “M.G.” owner’s initials. Etched and engraved, triangular form/rifle-type sideplate with matching surfaces: retains both of its sidebolts. 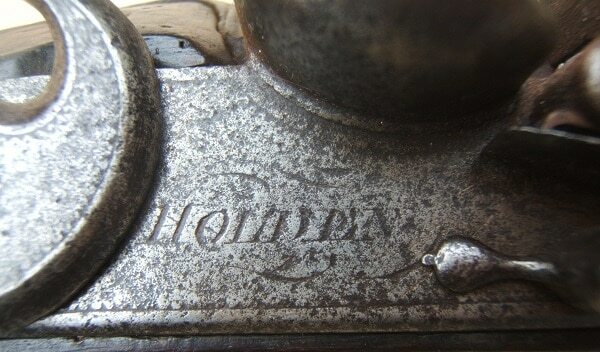 Flat, hound’s-tooth border-engraved lock with generally smooth steel-gray surfaces, 60%+ polish, some scattered discoloration and a “HOLDEN” maker’s signature, under the bridle-less powder-pan. (An unrecorded member of the “Holden” gunsmithing family of Birmingham and London, UK: please see H. L. Blackmore’s: “Gunmakers of London…”, pg. 115 and E. Heer’s: “Der Neue Stockel”, vol. 1, pg. 541). In mechanically functional order with a strong mainspring and fine timing. The gooseneck hammer and frizzen, en suite with its teardrop finial frizzen-spring. In overall fine+ untouched condition. The barrel with 85%+ brown finish, sharp contours, a deeply toned age-patina, clear markings and a fine touch-hole. The stock with 85%+ finish, sharp contours/carvings, minor abrasions and light expected wear/signs of use. Fine mechanism/lock with matching steel surfaces, a clear maker’s signature and a strong mainspring. Complete with its brass-tipped wooden ramrod with iron jag. A very nice example of a scarce French & Indian War/Revolutionary War Period English Flintlock Officer’s Fusil, ca. 1760. For similar examples and additional information, please see G. W. Neumann’s: “Battle Weapons of the American Revolution”. Overall length, 55 3/4″.